At some time within five day of being deposited, these planthopper eggs (not exactly - but I don't know how else to refer to this stem scar) were visited by this tiny female wasp. She (the same one I assume - my tag and release program did not work too well here) prowled around for at least three days further and then disappeared during the following several days of wind and/or rain when it was impossible to observe. The photo will likely not be much help for identification but the selection of host may be. When should I expect to see either hopper'lings or wasp'lings emerge? 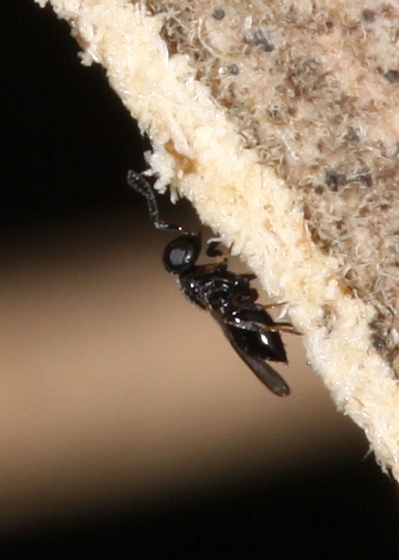 I suspect this family of parasitoid wasps due to the strongly elbowed antennae that attach low on the face, the glossy black appearance, pubescent wings, and an elongated abdomen with sharp margins. They mainly parasitize gall midges and gall gnats, but they also will attack whiteflies and mealybugs (these look like mealybugs), laying eggs in their larvae or pupae. What eventually emerges may be a combination of wasps and/or hosts. Not sure of development times - you might have to keep an eye on that. Nice work Roy.